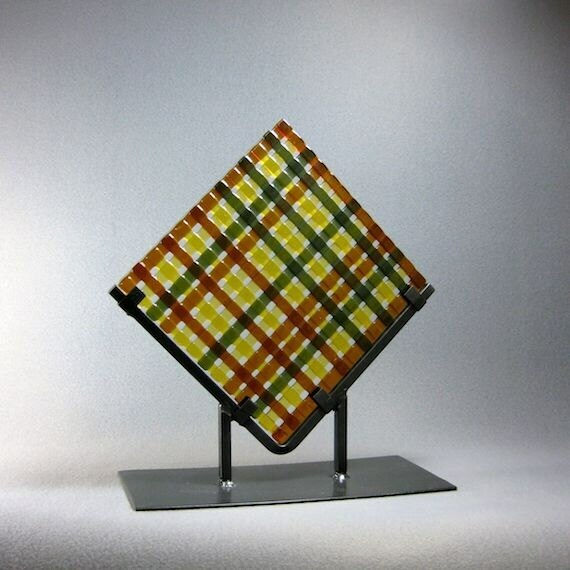 Art glass garden sculpture sun catcher weave brown, amber and green for your garden or home. Where better to find the that light but in your garden. We always felt that our glass needed your garden as much as your garden needs our glass. Let the colors shine in your flowers, along your paths and in among your hardscape and seating. In order to achieve our goal we designed and had custom made wrought iron stands for proper presentation and to hold your glass securely. Approximately 30 pieces of glass of varying colors come together to make a unique presentation. Amber, Olive Green, and Pale Amber along with clear give a ripple effect of multiple layers or a woven feel. The texture of one, two and three levels makes secondary colors as colors overlay each other. This piece just makes you happy as it appears to radiate light and a positive feeling. All of our pieces are dramatically effected by the light and give different variations as you adjust their position. This Studio Art measures 8" square for the glass itself. This piece comes with a table top stand at no additional cost. There is also another stand available for the garden at an additional price. The freight will also be additional too. The stand has two feet cut at a 45 degree angle to allow you to push them into the ground with ease for a secure placement. The stand measures 34" from the ground to the base of the V and a total of 45" from the ground to the top of the glass. Each stand is sprayed in black with a weather resistant paint. The total area of the stand is 48.25" tip to tip and 12" wide. Please email me with your choice. Our Studio Art comes with its own table top black wrought iron stand at no added cost.. Each Art Glass piece is one of a kind. Many require multiple firings to achieve the end result. The descriptions are what I see and feel as the artist. No photographs can completely capture the brilliance of the glass. All our glass is lead free. Hand washing recommended. Bring for the winter as freezing water trapped int eh details could damage the glass.